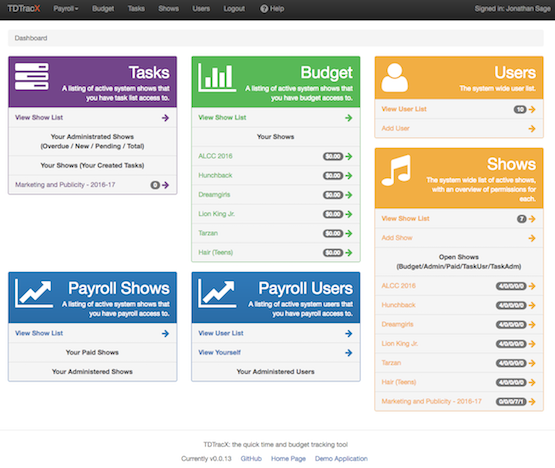 TDTrac is a web based show budget and payroll hours tracker, built by a Technical Director, for other TD's, freelance designers, and anyone else who finds it useful. TDTrac is completely free, released as open source. We also offer hosting plans for a nominal fee (no domain required!) so you don't need to pay for webspace elsewhere. An unlimited number of active or inactive employees. A secure interface to allow employees to track their own hours. Fine grained access control on a per show/job basis. Fully mobile-ready interface for phone, ipod, tablet or netbook use. Please refer to the ever-changing README.md file in the distribution. TDTracX is not directly compatable with TDTrac. There are a few tools in the distro to attempt to import you old users and data, but none are in working order yet. The demo includes online help on each page, as does every install. The only thing that is broken on the demo is e-mail notifications, as dummy e-mails were used. This package includes all the bleeding edge features, with automatic updates to the latest branch version. It includes weekly offsite data backups and limited e-mail support. This package accepts occasional, minor outages, and is priced at $35USD per year. This package includes automatic updates to the latest stable version, high priority uptime, and extreamly limited e-mail support. It also includes weekly offsite data backups. Currently, this package runs $30USD per year. This package includes automatic updates, with prior notification to the latest stable version, high priority uptime, and full e-mail support. It also include bi-weekly offsite data backups. Currently, this package runs $60USD per year.